Minnies winner: Accumulation of gadolinium in human cerebrospinal fluid after gadobutrol-enhanced MR imaging: A prospective observational cohort study. Nehra AK et al, Radiology, August 2018. To learn more about this paper, click here. 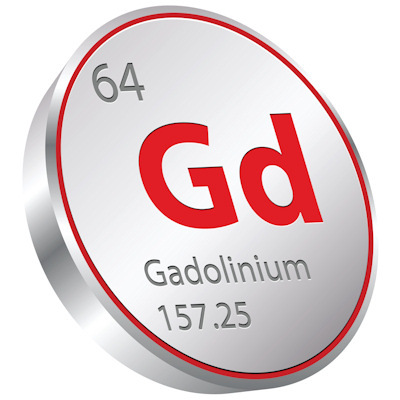 Why gadolinium from MRI contrast agents remains in human tissue long after imaging exams are performed is a question that has vexed radiology since the specialty first became aware of the problem. The winning paper in the Scientific Paper of the Year category sheds some light on the question. In the study, Dr. Avinash Nehra and colleagues from the Mayo Clinic in Rochester, MN, used spinal fluid samples drawn from lumbar punctures to detect gadolinium retained by adult and pediatric patients after they received a macrocyclic gadolinium-based contrast agent (GBCA). The trace elements were found in cerebrospinal fluid even in patients who had normal renal function and an undamaged blood-brain barrier. Previous research had postulated that gadolinium entered brain tissue only if a patient's blood-brain barrier was compromised in some way. The findings by Nehra et al indicate that cerebrospinal fluid may be the route gadolinium follows to enter brain tissue -- even in healthy patients. On the positive side, the researchers found that gadolinium concentrations were much lower in patients with normal blood-brain barrier function, compared with those whose barrier had been comprised. And all patients but one were clear of gadolinium 24 days after contrast administration. The Mayo group also won the Minnies award for Scientific Paper of the Year in 2015 for another study on gadolinium retention. Runner-up: Thrombectomy for stroke at six to 16 hours with selection by perfusion imaging. Albers GW et al, New England Journal of Medicine, February 22, 2018. To learn more about this paper, click here. Image courtesy of Butterfly Network. The origin story behind this year's winner in the Best New Radiology Device category is highly personal to Jonathan Rothberg, PhD, chairman and CEO of the Guilford, CT, company. Rothberg, a genetic scientist who invented DNA sequencing on semiconductor chips, has a daughter with a health condition called tuberous sclerosis that requires ongoing imaging. As he accompanied her for her scans, he became frustrated at the high cost and relative scarcity of imaging technology. There has to be a better way, he thought. Much as he developed a way to put DNA sequencing on a chip, Rothberg decided to try to develop an imaging technology -- ultrasound -- that could be miniaturized and mounted on a semiconductor. The Butterfly iQ scanner is the culmination of his dream. Butterfly iQ dispenses with the traditional ultrasound transducer technology using piezoelectric crystals that's been the foundation of the modality since the 1960s. Instead, Butterfly's technology consists of silicon fabrication and microtransistors -- basically, an ultrasound scanner on a chip. 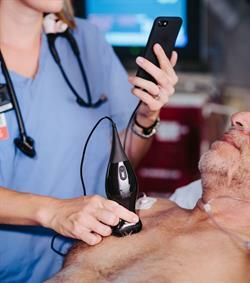 Users simply plug the transducer into any smartphone or tablet computer and start scanning. The company's major achievement is integrating both the transducer and the computer that processes ultrasound signals into a single silicon chip, a micromachined array with 10,000 transducers on it, according to Gioel Molinari, president of Butterfly. The company has spent some $100 million perfecting the technology, he said. But the company's marketing strategy might be even more revolutionary than the technology: It is selling Butterfly iQ transducers for $2,000 plus a subscription plan that runs about $35 a month for a single user or $100 for a team of 10 users. At that price point, Butterfly hopes to achieve massive dissemination of its technology among the some 40 million healthcare professionals around the world -- with the hope that the scanners become so ubiquitous that they become the equivalent of an electronic stethoscope. Butterfly began shipping Butterfly iQ in mid-October, after testing the scanners for nine months in the field, and will be exhibiting at the upcoming RSNA 2018 meeting. While the company hopes its technology will be adopted by many nonradiologists, it sees radiologists as having an important role in performing oversight and quality control of systems being used in the field. "This is something that we see as the next evolution of the toolkit that all healthcare professionals carry," Molinari told AuntMinnie.com. "We see it as a visual stethoscope." In stroke care, time is brain. The winner of the Best New Radiology Software award -- Viz LVO from software developer Viz.ai -- is designed to speed up diagnosis and treatment by serving as an early-warning system. The software analyzes CT angiography (CTA) images after acquisition and immediately notifies providers that a patient may be having a stroke. 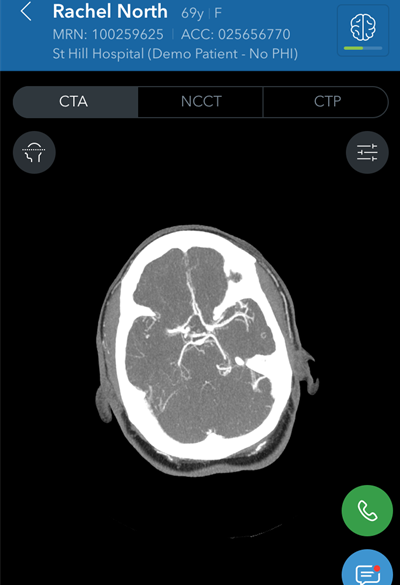 If the artificial intelligence-based software detects a suspected large vessel occlusion (LVO) stroke on a CTA exam, it triggers a mobile app push notification/alarm for the institution's stroke specialist team, which typically includes a neuroradiologist, an interventional radiologist, and the neurologist on call. The median time from image acquisition to notification is less than six minutes, according to the company. The physicians can then click on the notification on a mobile device and view nondiagnostic images using a mobile DICOM viewer. With Viz.ai's companion Viz CTP software, they can also obtain blood flow measurements in the affected area of the brain. "Our overall goal is to improve outcomes for patients who are having a large vessel occlusion stroke by supporting the clinical team in their workflow and their communication," said Dr. Chris Mansi, a neurosurgeon and CEO and co-founder of Viz.ai. This timesaving application was deemed so important by the U.S. Food and Drug Administration (FDA) that it was granted marketing authorization in early 2018 via the agency's de novo premarket review pathway, which allows vendors to petition the agency to down-classify a novel, previously unclassified device that's considered to have low to moderate risk. Importantly, the FDA clearance established a new predicate device and regulatory classification for computer-aided triage devices, enabling subsequent devices with the same intended medical imaging use to go through the 510(k) process rather than requiring the more rigorous premarket approval application. Even though Viz LVO has only been on the market for a few months, demand has been brisk. More than 20 large healthcare systems have installed the application or are coming online over the next six months, Mansi said. Several EnvoyAI platform results from AI companies on the EnvoyAI Exchange are shown within TeraRecon's Northstar AI Results Explorer. Image courtesy of TeraRecon. EnvoyAI is a spin-off of advanced visualization software developer TeraRecon, following TeraRecon's acquisition of McCoy Medical Technologies in 2017. The company debuted at RSNA 2017 with EnvoyAI Exchange -- a vendor-neutral marketplace designed to connect AI software developers with researchers and healthcare providers. Developers can use the Exchange to share their algorithms for testing and, later on, for clinical use and commercialization. Meanwhile, individual physicians can use the EnvoyAI platform to interact with AI in whatever manner they wish, according to the company. Now in its third major release, the EnvoyAI platform is more than just a marketplace for AI algorithms, said TeraRecon President and CEO Jeffrey Sorenson. "[The platform] is about allowing every physician to have an individualized ability to experiment and welcome AI into their workflow in a wide range of different ways," he said. "Some want to know that some AI algorithms have run, but they don't want any a priori knowledge; they don't want to have it blurring or influencing what their diagnosis would otherwise be. Some want to have it where they can see the results of the different AI engines, but they don't want it in the permanent patient record. And some want to have the actual AI show up in their diagnostic PACS viewports, but want to control what goes into the patient's permanent record." Physicians can sign up for an account and install the EnvoyAI platform remotely at no cost in two hours, Sorenson said. "And they can experiment with 70 different AI algorithms [from 40 development partners] and take advantage of all of these different workflows," he said. Some of the algorithms have received U.S. Food and Drug Administration clearance and can be purchased by end users, while others are available for research use only. Customers can also use the EnvoyAI platform to implement their own internally developed algorithms, Sorenson said. After initial evaluation periods, users pay monthly subscription fees for the platform and for any AI algorithms they use. PACS software typically cannot readily accommodate AI algorithms. To make it easier to implement AI, the EnvoyAI platform now also includes TeraRecon's Northstar AI Explorer software, which enables users to view images and reports created by AI algorithms and to interact with them, according to the firm. Its user interface is compatible with all major PACS, electronic medical record, and enterprise viewing platforms. A significant number of PACS companies have embedded Northstar AI Explorer into their PACS software and are distributing the EnvoyAI platform as part of their offerings, Sorenson said. "We'll be showing that at many different places throughout RSNA ," he said. Radiology Assistant 2.0. Image courtesy of Dr. Woulter Veldhuis, PhD. Radiology Assistant 2.0 features peer-reviewed articles contributed by expert radiologists and is the result of a collaboration between Dr. Wouter Veldhuis, PhD, of the University Medical Center Utrecht and Dr. Robin Smithuis of Rijnland Hospital Leiderdorp. Smithuis is the founder of the Radiology Assistant educational website and nonprofit organization. Launched in 2017 after its predecessor was completely rewritten and rebuilt, Radiology Assistant 2.0 is a much more professional reincarnation of the app, adding better support for multitasking on the iPad, enhanced searching capability, clearer article layouts, and vastly improved full-screen viewing and scrolling functionality, according to Veldhuis. Roughly 35,000 users in more than 100 countries around the world have currently installed the app, which now includes 115 articles in eight radiology categories, according to Veldhuis. 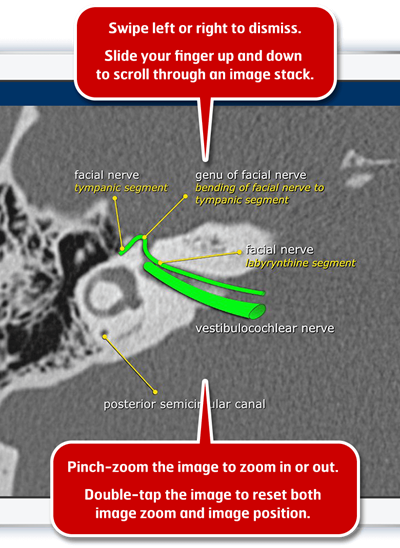 "Many residents use the Radiology Assistant during their day-to-day reading of cases," Veldhuis told AuntMinnie.com. "But expert users also search the app for specific knowledge, especially on topics outside of their main expertise." Veldhuis and Smithuis welcome additional article submissions. "We see both experts writing articles themselves -- often a rewrite of a presentation or review they already have created -- and residents writing an article under the supervision of an expert radiologist," Veldhuis said. "Both approaches are fine." Although free to download, Radiology Assistant 2.0 requires a subscription to access article categories. Admirably, income earned from subscription fees is donated to the Medical Action Myanmar (MAM) medical aid organization. "We were not 'in it' for the money, and Robin's brother is one of the co-founders of Medical Action Myanmar," Veldhuis said. "The decision was automatic: We would use the money to cover costs for servers and hosting and give the remainder (the bulk) to the MAM foundation, knowing that zero dollars would be wasted on 'legal, 'management,' etc., and that 100% would go toward the people in need."